Guardians of the Galaxy Vol. 2 is a 2017 superhero flick based on Marvel’s Guardians of the Galaxy. It’s the sequel to 2014’s Guardians of the Galaxy and the fifteenth entry of the Marvel Cinematic Universe. 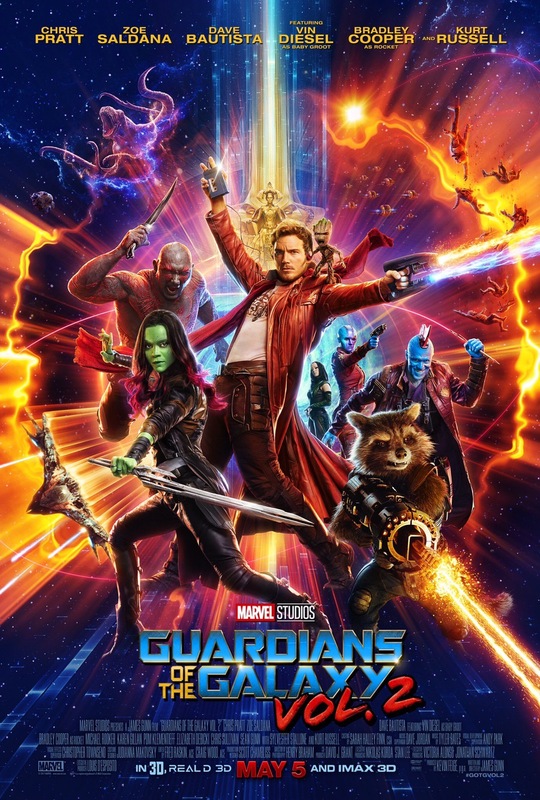 It brings back writer/director James Gunn and most of the actors from the first film including Chris Pratt, Zoe Saldana, Dave Bautista, Vin Diesel, Bradley Cooper, and Michael Rooker and brings in newcomers like Kurt Russel, Sylvester Stallone, Pom Klementieff, and features one hell of cameo from (*spoiler alert*) David Hasselhoff. The film tries hard to recreate the magic of the first one and it succeeds for the most part. The humor is there, the character interaction is there, the action is there, but it’s missing the joy of discovery. At this point we know what to expect from Star-Lord and his crew. That’s not a bad thing. You’ll like it if you liked the first one. My girlfriend hadn’t seen the first one so we watched it on demand and then watched Vol. 2 later that night. That’s practically five hours of Guardians of the Galaxy in one sitting and we didn’t get sick of it. That’s impressive because I have a short attention span. I’ll end this review on that note because I hear the ice cream man outside. Guardians of the Galaxy Vol. 2 is good. Go see it in IMAX 3D if you can, it’s worth the money and not many movies are these days.